Excellent for pies, sauce, and baking; Great for fresh eating or cut up in salads. Professional’s choice for applesauce or cider, baking pies and other desserts. This popular variety was discovered as a chance seedling growing on the Mull- ins’ farm in Clay County, West Virginia around 1900. The Stark Brothers Nursery introduced the apple commercially in 1916 as a companion to the Red Delicious eventhough the two varieties are not related. The parentage of Golden Delicious is unclear. Many people speculate the chance seedling can be traced to the Golden Reinette and the Grimes Gold- en. Today there are several golden-like chance seedling varieties in existence, including Ginger Gold, Earligold, and Lucky Rose. This mellow, sweet apple thrives in the dry, warm climate of Eastern Washington. It is perfect for many uses, especially baking and fresh eating. 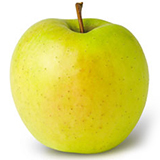 To select a good-quality Golden Delicious, look for a Washington apple with firm, smooth, clean skin that ranges in color from light green to pale or creamy yellow. Some Goldens may have a wash of pink color or blush across the “shoulders,” the result of warm, sunny, Eastern Washington days and cool summer nights.